Home to multiple minecraft mods including PortalGun, GravityGun, and Morph! Anyway, I was thinking back to how PG used to be, and how it has gone through multiple iterations as its been rewritten at least 4 times now, I’ve lost count to be honest, but every time I rewrote the mod, I had already learnt more and more about Java and programming in general. And so, with that, I wanted to highlight to you all how much seven years of being persistent, of regular practice, and of learning new things, can do to a project. I’ve went back and found the very first version of PG ever released for Minecraft Beta 1.3_01 (thanks to modmuss50), used the textures and sounds from back then, and rewrote the earlier versions of PG for Minecraft 1.12.2. When I first started modding, PG took me about two weeks to write and test and eventually release, in its own little buggy state. This rewrite, took 9 hours (over two days). This took a lot less time because I was much more familiar with Minecraft’s code base, I was much better with Java, and (you could say) I knew what I was doing. My point is: Keep at it. It gets easier. You get better. Now, on to the mod, which I’m calling Portal Gun Classic. Press the G key to “flick the switch” on the gun and use the portal of the other colour. The on-screen overlay for the portal gun was also brought back for PG Classic. The early versions never had it. This mod was made mainly for nostalgic reasons, and to allow a clear comparison between the current day PG and the early versions. Do not expect it to be updated beyond MC 1.12.2 nor for it to receive any support. As expected, the mod will need ModLoader, ModLoaderMP and AudioMod Minecraft Forge. One last thing I’d like to add. I’m making the source of this mod open source for people just starting out, to reference and possibly learn a thing or two from my code (and possibly even contribute to themselves!). EDIT: I feel like I need to clarify that this is talking about a Portal Gun Classic version. 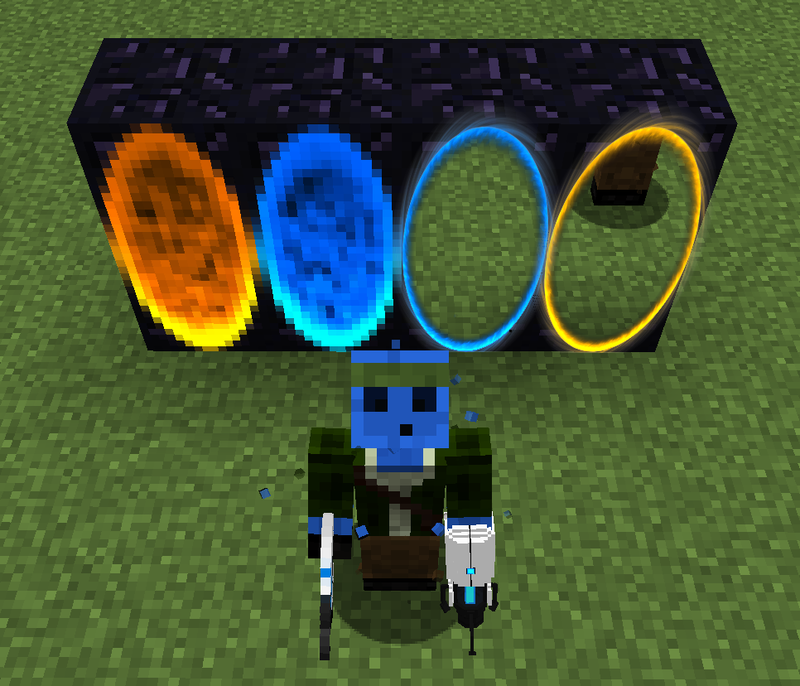 Portal Gun has been available for Minecraft 1.12.2 for quite a while now but can only be downloaded off CurseForge at this moment. Do mobs in this version behave as they originally did in the version you rewrote? That is to say, if a spider walks into a portal gun, it gets stuck in an endless cycle if it’s traveling in the correct direction across the 2-wide side of a pair of portals laid side by side? Can a 3 high Enderman still get stuck in it and suffocate in the portal? I liked how easy it was to trap hostile and passive mobs alike and mostly liked using it to clean up mob spawns in dark areas that one often came across when Minecraft’s cave cutting algorithm made a cave or overhang appear. Could you not only work on 1.12 but also try to update the version of 1.7.10? I would like to have it in my server and let more players know it. I know this has nothing to do with the Portal Gun mod (which I have been a massive fan of since it came out! ), but do you think a macOS Touch Bar mod is possible sometime in the near future? “Portal Gun has been available for Minecraft 1.12.2 for quite a while now”. Does this mean it wasn’t actually being worked on anymore? You, know like implementing the long fall boots and cubes, etc. Heya Chun! I really miss the feature from the Portal Gun where you could place a Portal on the Moon, and get things sucked up into the vacuum! Please Re-add this feature! Where are the other stuff like long fall boots, cubes, turrets, faith plates? It is super boring only having with the guns themselves! Can you add these items into 1.12.2 because I REALLY REALLY want these items so I can finally enjoy my dream mod. This is a very fun mod, I found that he did not appear on the Chinese bbs, can I put him on? I will indicate that the author is you, and will post the link, I hope you can agree to let more players play this fun mod. My site is outdated, I know. Portal Gun is back. Here’s what’s new, and what’s to come.